This beautiful image ‘The Star’ from the Crowley tarot deck is totally appropriate for this new moon @ zero degrees Aquarius on Jan 20th/21st. “When you wish upon a star Makes no difference who you are Anything your heart desires Will come to you! Scroll down for the lyrics to this Disney song to inspire you for the month ahead. Here we see ‘The Water Carrier’ in the role as the conduit bringing ‘heaven down to earth’ as inspired ideas from our Soul and the fresh directions & doors these open. You have to believe in your power to make your dreams come true & your right to be a free individual who is not controlled by anything or anyone OK? 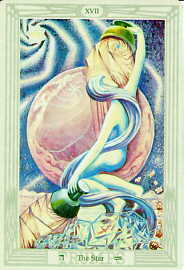 Aquarius is the sign of ‘humanity’…the collective group who share our planet. The ideals of Aquarius inspire the history of revolutions against those who seek to limit and control personal freedom and the rights of all people to share equality, fraternity and individual personal freedom. Over the next 100 years or so as we move between the passing Age of Pisces into the emerging Age of Aquarius we are challenged to finally create a planet where this may the case, and as we have seen recent years are loaded with the increasing pressure for this to begin to be the ‘modus operandi’ for us all. This is the first of 2 new moons in Aquarius, which is unusual as the first must be @ zero degrees for the next to be @ 29 degrees. Could it be that our cosmic systems are offering us an extra reminder that it is time to re-invent ourselves and release the past? The next Aquarian New Moon on Feb 18th also ushers in the Chinese New Year of the Wood Sheep/Goat…more on this next time or check my 2015 Year Ahead Report for details. The NMoon connects well with Saturn who has recently entered Sagittarius. So our urge to re-invent and dare to risk the new is creatively linked with fresh knowledge and new horizons and people. Aquarius ignites new sparks…Saturn says keep it real and stay grounded. Sag is the sign of ‘international’ interconnection and as I pointed out in my 2015 Report, Saggie territory involving ideals and the religions these inspire, hence the recent new sparks of terrorism in the west. And as I also pointed out the upside of this is the huge positive response from everyday folks that is uniting the global community as never before. This kind of scenario reminds me that the negative contains the positive…after all that’s the way Saggie extremes operate. Another important feature here is Uranus…the planet that rules Aquarius…sits exactly with the Nodes…the karmic directions in the cosmic process that link the past with the future. So be on high alert for people popping in from the past who may hold keys to your new directions…and vice versa! The other feature in the month ahead comes from dear little Mercury…planet of connections both mentally and physically. He turns retrograde on Jan 21st until Feb 12th also in the sign of Aquarius. Mercury retrogrades (apparently goes backward) three times each year. As this is the planet whose magnetisms affect all forms of communication, then these are the times when IT and gizmos don’t work properly and messages/mail gets lost…you get the idea. So don’t buy new appliances, be aware that travel plans may change, avoid signing contracts etc. as details are often incorrect. The upside is time to develop unique ideas and like minded networks during this period for forward motion after mid Feb.
To create the freedom of Aquarius we have to ‘liberate’ people, things, attitudes, ideas, world views and what we used to believe kept us safe. We have to become ‘objective’, which does not mean detached or distant so we can cut off or out…or other nasty hurtful actions. It means stepping up to a very cool place where we ‘observe’ the world and don’t emotionally blow up or out…so we can make conscious choices and decisions. This after all is the whole point of the ‘shift’ from unconscious to conscious…or ‘Unity Consciousness’ where we are ‘free to unite our rational left brain with our intuitive right brain. So the question becomes do you really trust yourself to be free? Who will you be? Who and what do you need to release? Are you willing to expand your reality with new ideas and technology so you may move forward? Your mantra is “I am now free to be me”. Once we jump on the change machine we invite and attract all kinds of splendid new unexpected developments. Sweet Venus joins activator Mars in late Feb until the next NMoon in inspirational Pisces adding a lovely softening agent to the mix…romance…the arts…compassion. Lovely! Just remember the purpose of life is to learn to love…hence the Piscean qualities of our humanity…compassion and empathy. Huge thanks to the dear friends who sent me your $ gifts to support my work after my 2015 Report. Even better than the $ were the many warm messages/emails I received sending thanks for my ongoing commitment to spreading a little light (and sometimes some rather hard info) in these times of radical transformation! Isn’t it a marvelous time to be alive…even when things are so weird?! By the way I have had a very positive start to 2015…the intense Saturn in Scorpio energies have abated somewhat, and my own Saturn/Pluto transits have finally passed so I’m sure this has helped. Hope this is also the case for you my dear readers. The key to life from here is to learn to flow and give up resistance…to trust. I send love and blessings to you all. Live long and prosper! It’s always a great idea to empower ourselves at the beginning of a year!! So please join me for my traditional new-year seminar, as I present in depth ideas and info for the ‘big picture’ of what 2015 has in store from our astrological cycles in the Chinese Year of the Sheep/Goat. We will have a good look at Saturn in Sagittarius between 2015-17 and how this will affect our global story, plus your life personally…so bring you chart details with you! How does Jupiter in Leo and then moving into Virgo mid-year fit in the complex jigsaw puzzle of the ongoing Uranus Pluto transformational ‘zap zone’? So please join me for a fascinating fun day so you can get inspired about your growth & opportunities over the next year. All welcome at any level of Astrology as this program is also great for non-astro peeps. You may order recordings of the workshop if you cannot attend. As Saturday 14th is ALSO MY 60th BIRTHDAY we will be popping bubbles after the seminar here in Carrara! !